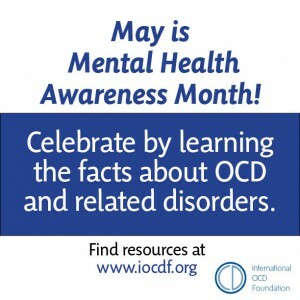 Today’s blog is a guest entry from our partners at the International OCD Foundation. Imagine you woke up one day during a particularly stressful time in your life, and your mind got stuck on a single thought. Perhaps you were anxious about a project at school or work, and were worried that you had made a mistake. Imagine your mind would not let that worry go. Instead, you replayed that anxious thought over and over and over again in your head. Imagine that you could not convince yourself that it was okay, even after re-checking your work and finding no mistake, or finding a mistake, but reasoning with yourself that it was minor and fixable. Now, imagine you woke up everyday with this feeling — this relentless anxiety — regardless of whether there was actually something worrisome happening in your life. Imagine this anxiety left you unable to get out of bed in the morning, or unable to leave the house, or unable to start any project for fear of making another mistake. For approximately 3 million people in the US alone, this is a reality. This is obsessive-compulsive disorder, or OCD. OCD is an anxiety disorder which causes an individual to have obsessions and compulsive behaviors that are so severe, they interfere with the individual’s everyday life; for example, causing the individual to miss work, school, social events, or other important activities. Now imagine that everyone knew about what caused OCD and how to treat it. And imagine there was no stigma associated with asking for help or admitting you had a mental illness. Imagine that everyone had access to effective, affordable mental health services. Unfortunately, this latter part of the scenario is not yet a reality for most people. On average, it can take 14 to 17 years to get a proper diagnosis and effective treatment for OCD after first showing symptoms. Can you imagine if that were the case for other illnesses? For cancer? At the International OCD Foundation (IOCDF), we work to improve the lives of all those affected by OCD and related disorders. Founded in 1986 by a small group of individuals with obsessive compulsive disorder (OCD), the IOCDF has grown to be the world’s leading resource for OCD and related disorders. Thanks to the patronage of members and donors, the IOCDF is able to provide support, education, and resources for those living with OCD and related disorders, family members, researchers, and professionals who treat these conditions. Based in Boston, the IOCDF has affiliates in 25 states and territories, as well as 11 Global Partners. We assist the OCD community in a variety of different ways, including providing access to resources and support. Our websites, which cover OCD (iocdf.org), OCD in kids (OCDinkids.org), hoarding disorder (helpforhoarding.org), and body dysmorphic disorder (helpforbdd.org), contain content written by some of the leading OCD mental health professionals in the world. In addition, our robust online Resource Directory allows community members to search for therapists, support groups, intensive clinics, and local affiliates. Throughout the year, we organize several OCD-focused events for the community, which include OCD Awareness Week, the 1 Million Steps 4 OCD Walk, and the Annual OCD Conference, which brings together health professionals, researchers, those living with OCD, and their loved ones, to learn about the latest research, treatment, and practice in OCD and related disorders. In addition to these community events, our IOCDF Training Institute hosts professional trainings throughout the year so that more health professionals are trained in recognizing and treating OCD. The IOCDF is always looking to expand our resources to meet the needs of the community. As we look toward the future, we have begun establishing brand new community programs such as our Transition Packet Program which will provide information, education, and resources for individuals transitioning out of OCD residential programs, as well as our Anxiety in the Classroom Program which will reshape the way OCD is talked about in schools. With the support of the community, we hope to continue to increase awareness, reduce stigma, and improve the lives of even more people affected by OCD and related disorders. To learn more about the IOCDF, including information about how to attend an event, become a member, or make a donation, please visit iocdf.org today. On average, it can take an individual with OCD up to 17 years from the onset of symptoms to receive a proper diagnosis and begin receiving effective treatment. Together we can help to change this statistic by increasing awareness and ending the stigma associated with mental health disorders. 1 in 100 adults are estimated to have OCD. To learn more and gain perspective on this statistic, read this guest post by Morgan Rondinelli. There are as many children in the US with OCD as there are children with diabetes. To learn more, visit our OCD in Kids website. OCD can emerge at any time from preschool to adulthood, but most commonly appears between ages 10-12 or in late teens/early adulthood. Click here to learn about out our new programming specifically for these age groups within the Annual OCD Conference. It takes, on average, between 14 to 17 years between onset of OCD symptoms and access to effective treatment. OCD-related conditions include hoarding disorder (HD) and body dysmorphic disorder (BDD) as well as hair-pulling disorder (trichotillomania) and skin-picking disorder (dermatillomania). To learn more about related disorders, click here. If more people knew these facts, would they be more willing to help support the OCD and related disorders community? Would you be willing to partner with us to help spread the word about what OCD really is? With your help we can increase access to resources, support, and treatment for everyone affected by OCD and related disorders.